If you’re a fan of the pre-washed, pre-packaged mixed baby greens, chances are that you have come across tatsoi. Okay, so it’s a green but what other interesting tatsoi plant info can we dig up, along with tatsoi growing instructions? Let’s find out. Tatsoi (Brassica rapa) is indigenous to Japan where it has been cultivated since 500 A.D. This Asian green belongs to the cabbage family of Brassicas. A low growing annual with small, spoon-shaped leaves, tatsoi is also called spoon mustard, spinach mustard or rosette bok choy, of which it is a close relative of. They have a mild mustard-like flavor. The plant looks similar to spinach; however, the stems and veins are white and sweet. The plant with its distinctive green, spoon-like leaves, only grows to about an inch high, but it can reach a foot across! This little plants thrives in cool weather; it can even withstand temps down to -15 F. (-26 C.) and can be harvested out from under a snowfall. So the question is, “How to use tatsoi”? As mentioned, tatsoi is often found in baby mixed greens and used for salads, but it can also be cooked. It is rich in beta carotene, and Vitamins A, C and K along with calcium, potassium, phosphorous, and iron. Tatsoi tastes much like bok choy and, as such, is often added to stir fries. It is also used in soups or lightly sautéed as with spinach. The beautiful leaves also make a unique pesto. A rapid grower, tatsoi is ready to harvest in just 45 days. Because it likes cooler temps, it can also be planted in the fall for a second crop in many areas. Although tatsoi thrives in cool temps, growing tatsoi should be situated in full sun in well-draining soil. Prep the planting site by tilling down 6-12 inches to loosen any compacted soil. Incorporate 2-4 inches of compost or manure prior to seeding or add a balanced organic fertilizer. Sow tatsoi seeds directly into the garden two to three weeks prior to the last expected frost in the spring. While tatsoi likes cool weather, frosty spring conditions can cause the plants to bolt. You may want to start seeds inside six weeks before the last frost and then transplant the young seedlings no earlier than three weeks before the last frost. Thin the young plants to at least 6 inches apart when they are about 2-4 inches tall. Water your tatsoi with 1 inch of water each week. Laying a 2- to 3-inch layer of hardwood mulch will aid in water retention and regulate soil temperatures. 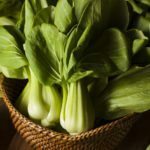 Tatsoi can be harvested as early as three weeks from planting for baby greens, or wait the full seven weeks to harvest the mature outer leaves of the rosette. Leave the rest of the plant to continue growing or cut tatsoi off at soil level to harvest the entire rosette. Plant tatsoi seeds every three weeks for a continuous crop. If you have a cold frame, you can continue to plant through mid-winter in some areas. Read more articles about Tatsoi.